Geological heritage sites, including sites of geomorphological interest and volcanic heritage sites, are under regular revision by the Geological Society of Australia, especially in the assessment of significance and value. Reference should be made to the most recent reports. See the Earth Science Heritage (external link) section of the Geological Society of Australia website for details of geological heritage reports, and a bibliography. 38 13 06S 143 06 08E (external link); 7521-4-3 (Lake Gnotuk) 831680. 4 km NW of Camperdown. Park Road. Hampden. A 'virtual aerial tour' of Lake Gnotuk is provided in this video clip. This high quality video clip runs for 51 seconds and is 3.1MB in size, which will take some time to automatically download if you are using a slow internet connection. Click the 'play' button and the video should display directly in your browser if this does not happen you may need to update the 'Adobe Flash Player'. This free software can be downloaded from the Adobe website (external link). Public land on the lake and lower shoreline. Private land on the upper crater walls and tuff ring. Tuff ring and maar crater. 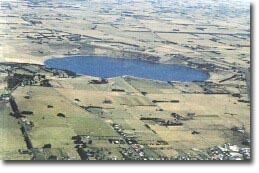 Lake Gnotuk is a smaller lake adjacent to and north of Lake Bullen Merri. Basalt in the walls of the tuff ring is believed to be part of the same lava flow as that at Bullen Merri. The two lakes are linked by an overflow channel in the common wall at an elevation of 175 m. The crater of Gnotuk is 2 km across and occupied by a saline lake (av. Salinity 60o/oo) with a flat floor at about the same elevation of Lake Bullen Merri. The water level of Gnotuk however is much lower and the maximum depth is less than 20 m. Lake shore terraces indicate previous higher levels and lake floor sediments and fossils show a record of past fluctuations in salinity, water level and climate. There is a 19th century record of water from Bullen Merri overflowing into Gnotuk. This is an outstanding example of a deep, simple maar. It forms one of the major sites for the study of Late Quaternary climatic fluctuations preserved in the sediments, pollens and diatom communities recovered from lake floor deposits. Grayson, H.J. & Mahony, D.J. 1910. The geology of the Camperdown and Mount Elephant Districts. Geological Survey of Victoria Memoir 9. Gill, E.D. 1953. Geological evidence in western Victoria relative to the antiquity of the Australian Aborigines. Memoir of the National Museum Victoria 18, pp. 25-92. Ollier, C.D. 1967a. Landforms of the Newer Volcanic Province of Victoria. In J.N. Jennings & J.A. Mubbutt (eds), Landform studies from Australia and New Guinea. ANU Press, pp. 315-339. Ollier, C.D. 1967b. Maars: their characteristics, varieties and definition. Bulletin volcanologique 31, pp. 45-73. Hills, E.S. 1975. The physiography of Victoria (5th edn). Whitcombe & Tombs, Melbourne. DeDeckker, P. 1982. Holocene ostracods, other invertebrates and fish remains from cores of four maar lakes in South-eastern Australia. Proceedings of the Royal Society of Victoria 94, pp. 183-220.